When last we checked, my version of the Mystery Quilt stood here. Then, a baby intervened, which gave me a convenient mechanism for tracking how long it had been since I worked on the project. Five and a half years later, I finally dug it out of the Crafty Closet to see what state I’d left it in, and discovered that it wasn’t as bad as I’d feared. They’re beautiful, don’t you think? I’m so proud of myself for getting so much done in such a short period of time! They’re also a full quarter-inch too small in both dimensions. 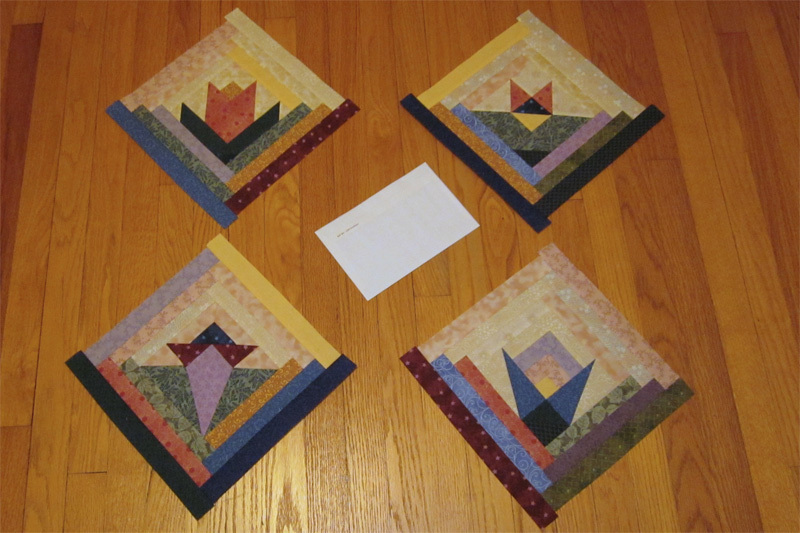 This entry was posted on Sunday, January 27th, 2013 at 8:33 pm and is filed under Mystery Quilt, Quilting Projects. You can follow any responses to this entry through the RSS 2.0 feed. You can skip to the end and leave a response. Pinging is currently not allowed. Ahhhh, yes. The seam ripper. As Herbert Hoover said, ” A chicken in every pot and a seam ripper in every room.” That’s what I remember. How about adding a narrow border to each of the blocks? And if Andrew says , “The rules must be obeyed,” tell him it is not required of Crackpots. I’m with Marty on adding a narrow border. If you take a look at my version of the quilt (which I don’t like as much as yours), You will see that the log cabin-y blocks “float” on a large background area. Using that fabric or one blends with it should work fine. Ah, too late for a narrow border! (Which I also think would have looked weird.) I’ve already disassembled and reassembled one of the blocks, successfully! And, doing this has allowed me to change the design just slightly and do what Ann did, and use the very-dark fabric for the outermost dark strips on the log cabin blocks, to make them “float” like she did — which is an effect I like a lot, and was disappointed to find that I hadn’t done. So now I can do that, which is cool.